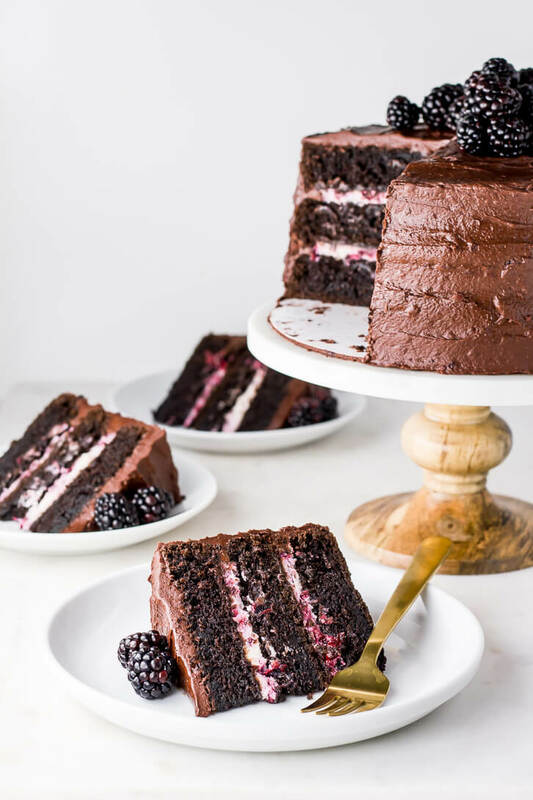 Blackberry Chocolate Cake: three layers of dark chocolate cake, filled with blackberry mascarpone cream and frosted with a fudgy blackberry chocolate buttercream. It’s hard to believe, but today Flour Covered Apron officially turns one year old! When I started this blog a year ago, I wasn’t sure where exactly it would take me. I just knew that I a) needed a creative outlet for my rediscovered addiction to baking, and b) wanted to connect with a larger community of passionate bakers! I’d be lying if I didn’t acknowledge there have been a lot of ups and downs with my blog. It’s quite literally been the product of my blood, sweat, and tears over the past year, and while I’ve often felt proud & excited, there’ve also been many days where I’ve just felt like quitting. But looking back, it’s been an incredibly rewarding journey and I’ve learned much more than I ever expected to! It wasn’t all that long ago that I could never imagine myself being a food blogger (or any sort of entrepreneur, photographer, recipe developer, web designer, or writer for that matter). Starting Flour Covered Apron has pushed me out of my comfort zone in a million ways and I’ve been as surprised as anyone to find myself here. Drive, and inspiration, and a passion for baking have certainly been instrumental in keeping me going, but most of all, it’s the community I’ve gotten to connect with along the way. You all encourage, challenge, and inspire me every single day. Whether you’re a fellow baker, blogger, photographer, foodie, or just a friend… thank you for tagging along! You are simply the best! So, to celebrate today’s anniversary, I made this blackberry chocolate cake. It’s very much inspired by a similar recipe from Fork Knife Swoon, but I made a few adaptations, including adding in a blackberry mascarpone filling. The chocolate cake is made with my favorite dark chocolate batter, which comes out of the oven rich, moist, and chocolatey! The key is pouring hot coffee into the batter at the end. It makes all the difference in bringing out the chocolate flavor, without making the cake actually taste like coffee. While the cakes cool, you’ll want to simmer some blackberries on the stove, along with a little bit of sugar. The syrup from the blackberry compote will be drizzled into the chocolate buttercream, while the mashed blackberries will be swirled into the mascarpone filling. For some extra texture and flavor, I did add a little bit of the mashed blackberries to the buttercream, too (optional). And the final finishing touch? A pile of fresh blackberries on top! Simple, rustic, and naturally gorgeous. Make sure to keep this blackberry chocolate cake refrigerated, since the filling is made up of mascarpone cheese. I recommend removing the cake from the refrigerator 1-2 hours before serving. Three layers of dark chocolate cake, filled with blackberry mascarpone cream and frosted with a fudgy blackberry chocolate buttercream. Preheat oven to 350 degrees and prepare three 8" cake pans by lining the bottoms with parchment paper. Then, butter and flour the pans. Thanks for sharing, love the idea of adding blackberries n mascarpone layer in chocolate cake.. just one question, do blackberries have seeds like raspberries? I love raspberries in cake but avoid using fresh ones due to the seeds. I find them annoying.. I am making a cake this weekend and would love ur view on this..
Hi there! Yes, blackberries do have seeds, similar to raspberries. For the frosting in this cake, you’ll only need the syrup from the blackberry compote, which you can strain to eliminate any seeds. To avoid seeds in the mascarpone layer, you could just use the syrup again (though you might need less cream in that case), or you could use a seedless blackberry jam, or you could even just add some extra powdered sugar to the mascarpone & just have a plain mascarpone filling. Great recipe. I made this cake for a family birthday party and it was a big hit. Please note the recipe says to add both baking soda and powder into the dry ingredient mix but does not give an amount for the powder. I added 1/4 teaspoon. Additionally adding a cup of coffee would have made my batter too thin so I added expresso powder instead. Truly yummy cake. Took me awhile to make but it was worth it. Hi Susan, I’m so glad to hear how much you all enjoyed it! Thank you so much for pointing out the discrepancy in the ingredients and the instructions, I’ve corrected it. Glad it worked out so well with espresso powder too. I find a thin batter gives me a really nice, moist cake, but that’s a great alternative too! I just have one question – instead of baking 3 layers in 3 separate pans, is it possible to bake them all together in one pan, and divide it in 3 afterwords? Hi Charlotte, I hope you enjoy it! I recommend baking the cake in separate pans if you can. It would probably be too much batter for just one pan (unless you have a pretty tall one). Even then, it would require a much longer cooking time and the cake will not turn out as moist. Even if you had two pans, that would be preferable to just one. Made this today for my mother-in-law’s 87th birthday. The smile on her face when she saw it was heartwarming. Everyone raved about it all evening. The recipe came up in a search on Pinterest for a gluten free chocolate cake and it wasn’t until I was in the middle of making it that I realized that it wasn’t gluten free. Substituted a cup-for-cup gf flour and the cake was moist and amazing! The blackberry marscapone filling and buttercream set it off to perfection. Thank you so much for this recipe, it had already been requested for the next birthday in the family. Hi Kim, that’s wonderful. I’m so glad to hear this worked out so well with the gluten-free flour substitute!! This looks delicious. What do you think about making it into cupcakes? How would I alter the bake / bake time? Hi Whitney, yes, you could use this recipe to make cupcakes, but it might be even easier to check out this recipe and use that cupcake recipe: https://flourcoveredapron.com/triple-berry-nutella-chocolate-cupcakes/. Then you could come back here for the filling & frosting. Good luck! This looks amazing, I am planning to make it this weekend! The only thing is I don’t drink coffee, so do you have a recommendation for what that can be replaced with in the recipe? Hi Keara, you could use hot water instead of coffee. Hi Sandra, I recommend using baking soda if possible! If you must use baking powder, you’ll need to add more of it to get the same amount of leavening. This could change the taste of the cake.